The airpointer&apos;s modular design comprising a base unit, analyzing modules and sensor modules allows for a configuration according to different application requirements. The airpointer&apos;s compact design enables it to be installed almost everywhere. 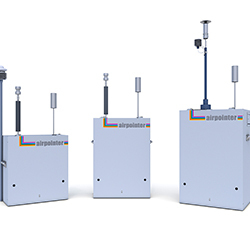 Due to its optimized thermal management, the airpointer consumes less power compared to conventional monitoring stations. The airpointer offers a choice of analysis modules using type approved reference methods for monitoring airborne pollutants (SO₂, NO₂⁄NOX, CO, O₃, and PM) classified as relevant by the EU, the WHO, the US–EPA and further responsible organizations all over the world. The integrated data management system records monitoring data of the airpointer&apos;s own analysis modules as well as various external third–party sensors. An internal web server enables data retrieval by using any Internet connection. Data are available worldwide via access authorisation and can be presented in clearly arranged graphics. All parameters can be displayed locally or online. For more details please contact us here or visit recordum Messtechnik GmbH.